On Tuesday, Jan. 28, unpredicted snowfall, rapidly dropping temperatures, and sudden school closings set the scene for major traffic delays in many southern cities, including my hometown of Birmingham, Ala. Within hours of the first snowflake, heavy traffic clogged major interstates, and accidents blocked many byways. Without warning, scores of employees were stranded at work while other citizens found themselves trapped while doing errands. As the hours dragged on, throngs of motorists ran out of gas or reached impasses and abandoned their cars in favor of finding shelter in homes or businesses opening as warming shelters. In stark contrast to the frigid weather, heartwarming acts of kindness quickly turned strangers into friends. Across the region, students numbering in the thousands were stranded at school overnight, but administrators comforted worried parents that teachers would care for their pupils until the last families were safely reunited. After a treacherous couple of hours trying to get to our children, my husband, Joe, walked home with our four. He said a genial spirit pervaded the caravan of families making the 4-mile trek, and on the way, they assisted other travellers along the slick highway near our house. I left my office in mid-afternoon with my co-worker Becky, who lives in our subdivision. After nearly four hours on the interstate and amidst radio warnings that most of us still on the road at that hour would spend the night in our vehicles, we sought shelter at the home of another co-worker. From her apartment, which is less than 3 miles from our office, we kept tabs on loved ones and neighbors through cellphones and social media. In particular, we prayed for a friend of my co-worker who spent the night in a Walmart with her severely disabled 18-year-old son. The mother set up a blow-up mattress as a makeshift hospital bed, and employees offered food and assistance while neighbors worked out a plan to get the pair up the icy hill to their house the next day. Becky and I started our journey home Wednesday around 2 in the afternoon. We made it a few miles closer before we had to leave her car and set out on foot. A man with a truck offered to take us the rest of the way, but we gave up our seats when we noticed a man with a cast on his ankle walking with his two children, still clutching their backpacks from school the day before. We couldn’t help but laugh as the driver offered to let down the tailgate and whisked us through our neighborhood on the back of his truck. He had been taking people home all day. Melissa Lester is assistant editor of Victoria Magazine. Her husband, Joe, teaches at the Jones School of Law at Faulkner University in Montgomery, Ala. They have four children and are members of the University Church of Christ. 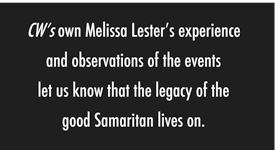 Melissa is the author of Giving for All It’s Worth and is a frequent speaker at ladies days.